The security of citizens, infrastructure and assets has become a high priority in the European Union. Strengthening capacities in disaster risk and crisis management and improving resilience in CBRN-E (Chemical, Biological, Radiological, Nuclear and Explosive) and natural and man-made disaster management represent key EU policy and research challenges. The overall EU security policy framework covers many different sectors, which implies needs for coordination among various communities. To reduce the current fragmentation in security research and facilitate information exchanges among and between policy-makers, research, industry (including SMEs), practitioners (first responders, civil protection units etc. ), and the general public, the European Commission – DG HOME organises a series of meetings of the Community Of Users ​that take place several times a year. 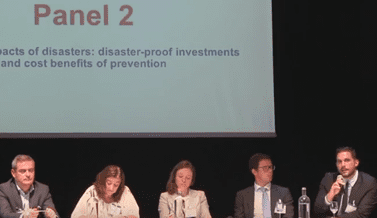 IN-PREP ICCS Evangelos Sdongos presented “Spending on prevention” showing the value of costs saved if budgets were allocated for prevention instead of disaster response. He also took part in the panel discussion Theme 7 – Mainstreaming disaster risk reduction and presented the IN-PREP poster on Interoperability during the exhibition.